The Government Bike to Work scheme encouraged a large number of employees at BAe Systems Submarine facility at Barrow in Furness to start to cycle to work. This gave the company a problem in how to safely and securely house over 450 bikes during the working day. The area can experience severe weather and a large scale, industrial quality solution was needed. Boldman has worked with BAe Systems over many years and has helped with many different projects in that time. Boldman uses an aluminium profile system but adding their depth of experience in design and manufacture enables them to adapt the system to meet customer specific requirements. 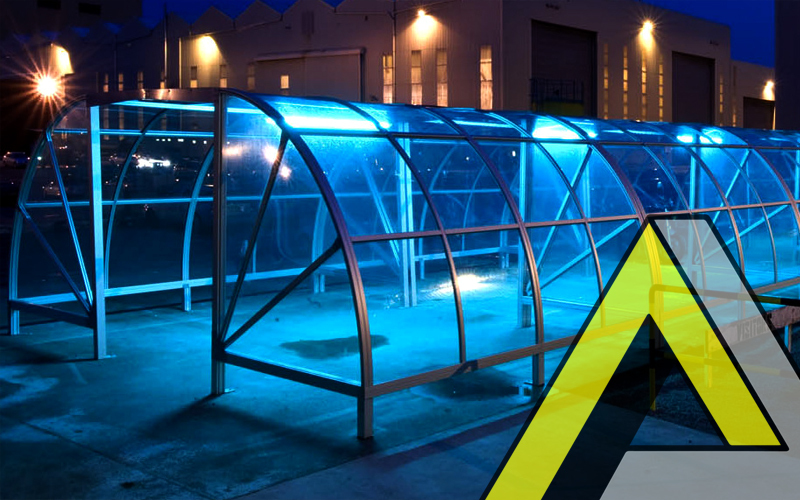 By incorporating rolled anodised aluminium profiles and polycarbonate UV resistant transparent panels Boldman constructed a bike shelter that is strong but allows bike users to also have 360 degree visibility. With individual modules designed to hold ten bikes, Boldman engineers installed the bike shelters on site, fastening together the modules into larger units to accommodate BAe Systems requirements. The design specification had been previously tested to withstand gale force winds and rain, so the final structures would be weather resistant. From design to installation Boldman worked closely with BAe Systems to ensure the final result was an environmentally friendly bike shelter delivered in optimum time and offering employees of BAe Systems the ultimate in protection for their bikes.